LoRa Alliance 10th ALL MEMBERS MEETING – Vancouver Canada, June 5, 2018 – Semtech Corporation (Nasdaq: SMTC), a leading supplier of high performance analog and mixed-signal semiconductors and advanced algorithms, announced that eleven-x, a Canadian LoRaWAN™ network provider for advanced Internet of Things (IoT) solutions, and the University of British Columbia (UBC), Canada’s third largest university by student population, have rolled out smart campus solutions for waste management and parking. Across the UBC campus, sensors using Semtech’s LoRa® devices and wireless radio frequency technology (LoRa Technology) are installed in waste bins and embedded in pavement to monitor real-time data to gain efficiency and reduce operating costs. 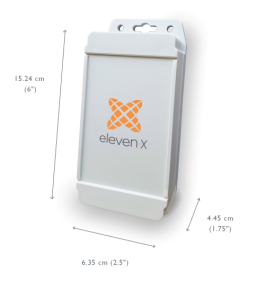 Both IoT solutions are connected to eleven-x’s LoRaWAN-based network, and provide real-time data to UBC administrators. In the waste management system, alerts are triggered and pushed to UBC staff when a pre-determined waste level has been reached per bin, indicating waste removal is required. Levels are monitored in real-time through third-party Cloud-enabled applications, optimizing maintenance response. UBC’s smart parking solution is designed to verify which parking spaces are used the most and, specifically, how many spaces are available for those with disabilities. The University plans to use the data collected by the parking sensors to evaluate expansion of parking areas for ease of access and increased efficiency. Semtech and eleven-X are presenting and exhibiting at the LoRa Alliance All Members Meeting in Vancouver, Canada from June 4-7.
eleven-x, a Contributing Member of the LoRa Alliance™, is a next-generation network operator enabling the Internet of Things (IoT). Our low power wide area network [LPWAN] is Canada’s first and only public coast-to-coast network supporting the use of low-cost sensors and devices for a variety of Smart City and Enterprise IoT applications. Based on LoRaWAN™, an international standard backed by over 500 companies, our carrier-grade network enables customers in the private and public sectors to efficiently and cost-effectively manage assets, create and maintain Smart Cities, and realize environmental sustainability. Follow eleven-X on Twitter: @eleven_x and on LinkedIn. Visit eleven-x.com for more information. The University of British Columbia is a global center for research and teaching, consistently ranked among the 40 best universities in the world. Since 1915, UBC’s West Coast spirit has embraced innovation and challenged the status quo. Its entrepreneurial perspective encourages students, staff and faculty to challenge convention, lead discovery and explore new ways of learning. At UBC, bold thinking is given a place to develop into ideas that can change the world. For more information, visit www.ubc.ca. All statements contained herein that are not statements of historical fact, including statements that use the words “will,” “designed to,” “plans to,” “should,” “to expand,” “to build,” “strive to,” or other similar words or expressions, that describe Semtech Corporation’s or its management’s future plans, objectives or goals are “forward-looking statements” and are made pursuant to the Safe-Harbor provisions of the Private Securities Litigation Reform Act of 1995, as amended. Such forward-looking statements involve known and unknown risks, uncertainties and other factors that could cause the actual results of Semtech Corporation to be materially different from the historical results and/or from any future results or outcomes expressed or implied by such forward-looking statements. Such factors are further addressed in Semtech Corporation’s annual and quarterly reports, and in other documents or reports, filed with the Securities and Exchange Commission (www.sec.gov) including, without limitation, information under the captions “Management’s Discussion and Analysis of Financial Condition and Results of Operations” and “Risk Factors.” Semtech Corporation assumes no obligation to update any forward-looking statements in order to reflect events or circumstances that may arise after the date of this release, except as required by law.